The principal Designer at Kitchens Direct NI, Jim Grew, has the advantage of many years experience as a Kitchen Fitter and utilizes this knowledge when carrying out his Design Consultation with each customer in their home as it gives him the opportunity of seeing how the existing kitchen is used by the family and what essential items they need in the new design. Using his creative flair for Kitchen Design, his knowledge of all the Kitchen Styles, Finishes and Accessories available, he can add his Kitchen Fitting Experience to the Design to produce a beautiful, yet functional Kitchen unique to each customer. Your Design Visit will normally take over an hour to complete as they discuss your requirements, let you take your time deciding on your colours and finishes, and take accurate measurements to help plan your Kitchen to meet the needs of your family and lifestyle. 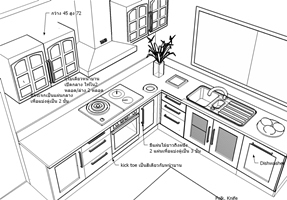 As all our Kitchen Units are manufactured on our premises at Templepatrick in County Antrim, we know the quality of our Kitchens and with Jim’s flair for Design and our Team of expert Tradesmen, we can take you from Design to Completed Installation within 4 weeks. We work hard to source our Kitchen Doors, Worktops, Handles, Accessories and Electrical Appliances through local manufacturers and distributors where possible to support Local Companies while ensuring our customers get the best in Design, Quality and Price.